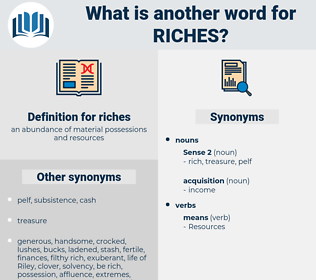 What is another word for riches? 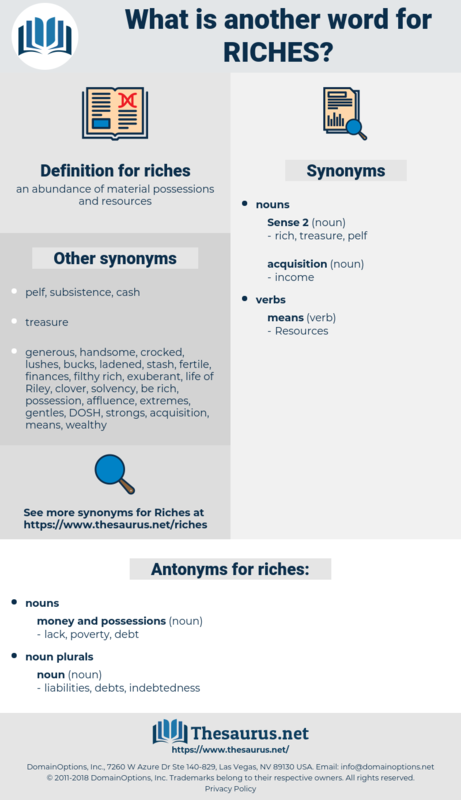 strengths, lovelies, treasuries, spoils, coffers, Legacies, estates, Gems, Remedies, features, jewels, Endowments, supplies, fens, shadows, haves, Bounties, Resources. You are now, I hope, wiser; and therefore take back your riches, which I hope you have now learned to make a proper use of. He left half a million, but he had used his riches well. risc, ras, rose acacia, rase, rachischisis, Rus, rickshaw, rorschach, rag, rescue, rocky, recco, reassess, reseau, rickey, rosy, rask, riga, reecho, recuse, raze, raceway, roseau, rejig, reuse, rockchuck, risky, rioja, ragi, roach, raree-show, rucksack, rug, ross, raise, rock cake, res, rough-house, rejoice, rhexia, rock, rococo, rhesus, recce, rosaceae, rakish, rosacea, rose, ruscus, re-argue, ruckus, rye whiskey, race, reggae, rick, richea, russia, Rya Rug, rice, roux, racy, Reyes, roguish, reach, rushy, resew, rake, resh, reich, rush, rugose, rookie, rise, roughish, ricksha, rousseau, rockies, rosa, rouge, resize, rash, rage, rough-hew, risque, rous, ruck, raj, rehearse, RG, ruga, Rex, re-echo, rich, rush away, rough, ruscaceae, roughage, rework, raucous, rogue, r.c., rag week, rook, roccus, rosaceous, rouse, razz, ruse, reek, reccy, rig, rack, roc, rachis, rusk, ragee, row house, raja, risk, rissa, roughhouse, rico, rye whisky, rhus, rehouse, reissue, ragusa, rajah, rehash, ross sea, rich's, recess.